German Chocolate Cake Recipe. Original old fashioned recipe, introduced by Bakers German Chocolate in the 1950's. 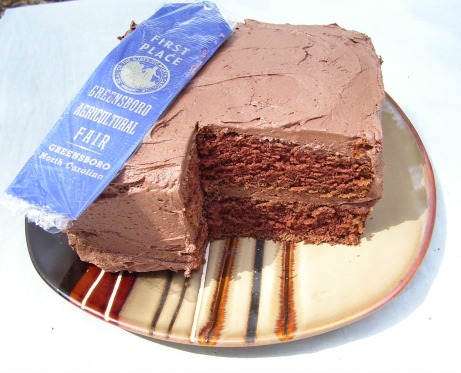 I won a Blue Ribbon for "Best Chocolate Cake" in a Guilford County cake baking contest in Greensboro, North Carolina, in the 1970s, three times in a row. For competitions, I frosted with Creamy Chocolate Frosting that my family liked better than the original Coconut Pecan Frosting. made from 100% Soft Winter Wheat. Melt chocolate in boiling water. Cool. Cream together butter and sugar. Add yolks one at a time, beating well after each addition. Add chocolate and vanilla. Mix well. Sift together salt, soda, and flour. Add flour and buttermilk alternately, mixing well until smooth. Pour into three 8" or 9" round cake layer pans. Bake in a 350F. preheated oven 350F. for 30-40 minutes. Remove from oven. Let sit in pans 2-3 minutes then turn out of pan and place on a rack to cool. Frost with Coconut Pecan Frosting, spreading between layers and on top. Combine milk, sugar, egg yolks, and butter. Cook over medium heat stirring until thickened, about 12 minutes. Add coconut and pecans. Beat until thick enough to spread on cake. Cream butter, cocoa, salt, and vanilla together. Beat in sugar, adding just enough cream to make it a spreading consistency. Beat on high speed to make it real creamy. Bake the German Chocolate Cake Recipe as above. You can bake the cake in three 8" square cake pans instead of the round pans. Frost between, on top and on the sides of two cake layers. The more cream you can incorporate into frosting, without making the frosting too thin to spread, the creamier it will be. The extra layer of cake can be served plain or topped with whipped cream, bananas, and nuts, if desired. This classic cake recipe has been the favorite chocolate cake of many families for many years. It's a keeper!